2102. Joseph Merriam, born about 1600 in Hadlow, Kent, England; died 01 January 1641 in Concord, Middlesex, Massachusetts, United States. He was the son of 4204. William Merriam and 4205. Sarah Burges. He married about 1623 in England. 2103. Sarah Goldstone, born about 1604 in Tonbridge, Kent, England; died 12 March 1671 in Concord, Middlesex, Massachusetts, United States. * William Merriam (1624-1689), married 1653 Elizabeth Bread (1634-1691). * Sarah Merriam (1626-1677), married 1648 Thomas Wheeler (1621-1704). * Joseph Merriam (1628-1677), married 1653 Sarah Stone (1633-1704). * Elizabeth Merriam (1633-1704), married 1653 Thomas Henchman (1630-1703). * Hannah Merriam (1636-???? ), married 1656 John Buss (1599-????). * John Merriam (1641-1724), married 1663 Mary Cooper (1645-1731). 4206. John Goldstone, born 1574 in Tonbridge, Kent, England; died 12 March 1671 in Concord, Middlesex, Massachusetts, United States. He married about 1597 in Kent, England. 4207. Frances Jefferie, born 1572 in Pemburie, Kent, England; died in . She was the daughter of 8414. John Jefferie and 8415. Jane LNU. * Frances Goldstone (1602-???? ), married 1620 George Dana (1620-????). * Jane Goldstone (1603-????) married 1620 Benjamin Johnson (1595-????). * Sarah Goldstone (1604-1671), married (1) 1623 Joseph Merriam (1600-1641); (2) 1642 Joseph Wheeler (1610-1681). * Elizabeth Goldstone (1606-1637), married 1622 Thomas Dana (1590-????). I have done no independent research on these families. * Lisa Louise Cooke's Genealogy Gems YouTube Channel: Protect Your Computer and Genealogy with Online Backup - Your questions answered! * Family History Fanatics YouTube Channel: I Smell the Blood of an Englishman! Did you miss the last Genealogy News Bytes - 10 April 2018? The state of New South Wales required a duty to be paid before probates and letters of administration could be executed. Deceased estate files were created for estates upon which a duty was imposed, including documentation and correspondence regarding the assessment of the estate. Search for your Irish ancestors in a collection of registers and records from the oldest city in the Republic of Ireland. The collection contains over 211,000 records taken from seventeen different databases spanning the years 1662 to 2006. Various events are recorded in this collection including burgess lists, burials, deaths, directories, emigration records, freedom petitions, freemen records, langable rentals (rent rolls), rate books, registers, and war deaths. Each result will provide you with a transcript. The amount and type of information recorded will vary depending on the nature of the event. Explore over 1000 digital images of the New Jersey death index covering the years 1901 to 1903. This collection has been obtained through Reclaim the Records. 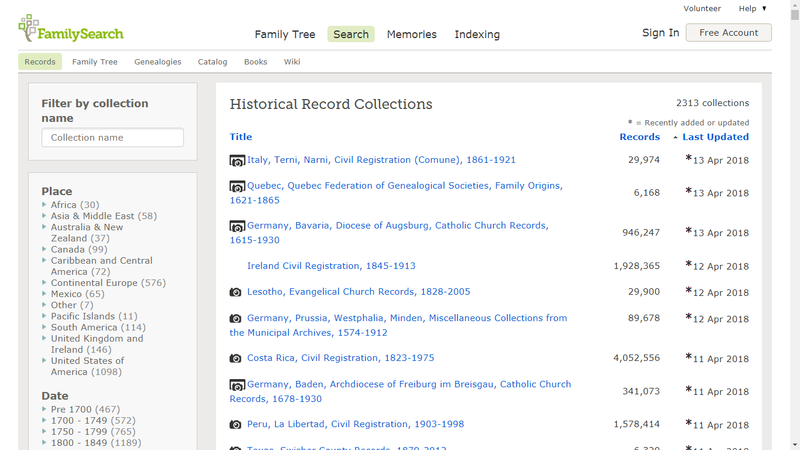 The index will allow you to discover your ancestor's death year and entry number. Additional information about these records can be found on the source's website. Explore over 7,000 digital images of the New Jersey marriage index covering the years 1901 to 1914. This collection has been obtained through Reclaim the Records. 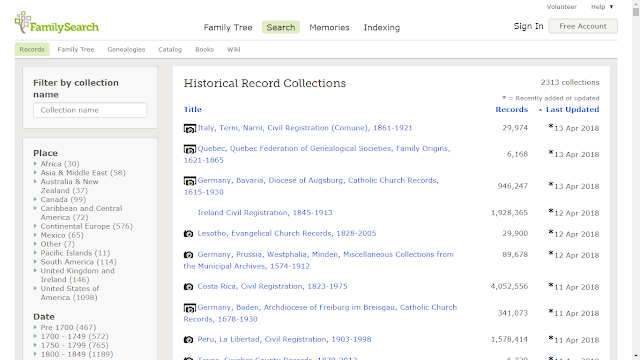 The 15 volumes included in this index will allow you to discover your ancestor's marriage year and entry number. This collection has been obtained through Reclaim the Records. Explore over 20,000 feet of fines records for Surrey created between 1558 and 1760. Feet of fines were documents of a fictitious suit of law created to obtain a secure transfer of land. The document recorded the final agreement (or concord), written in triplicate, between buyer and seller: two copies side by side and one copy across the bottom of the sheet (the foot of the fine). An indented or wavy line separated the three sections; one section was given to the seller, one to the buyer, and one (the foot) to the court. The idea behind this system was that forgeries could be identified by showing they didn't fit the three-piece jigsaw of the authentic, original foot of fine. The amount of detail provided varies from period to period. For example, some will provide the full names of all the buyers and sellers while others only provide the last name of the first buyer in a transaction. Hundreds of new records have been added to our collection of Cornish burials. The collection now contains over 280,000 records covering more than two hundred parishes across the Cornish peninsula. The new additions cover Dissenter burials in Falmouth and Penryn between 1808 and 1926. Each result includes and transcript of an original parish register that may reveal a combination of your ancestor's birth year, death year, burial place and residence. Ruth (Graves) Buck is #313 on my Ahnentafel List, my 6th great-grandmother, who married #312 Isaac Buck (1706-1780) in 1729 in Reading, Massachusetts. * their son #156 Isaac Buck (1732-?????) who had a relationship with #157 Mary Richards (1733-????) in 1757. * their son, #78 Isaac Buck (1757-1846) married #79 Martha Phillips (1764-????) in 1780. * their daughter, #39 Sophia Buck (1797-1882 married #38 Thomas J. Newton (ca 178800-????) in about 1834. * their daughter #19 Sophia Newton (1834-1923) married #18 Edward Hildreth (1831-1899) in 1852. Ruth Graves was born 10 January 1710/11 in Lynn, Massachusetts, the daughter, and only child, of Thomas Graves and Ruth Collins. Ruth (Collins) Graves died before 1715 when Thomas Graves married his second wife, Ruth Taylor. At some point, the Thomas Graves family moved from Lynn to Reading, Massachusetts. Ruth Graves of Reading married Isaac Buck of Woburn on 3 December 1729 in Reading, Massachusetts. The marriage was recorded in both the Reading and Woburn vital record books. Isaac and Ruth (Graves) Buck resided in Wilmington, Massachusetts, and had six children between 1730 and 1740; the first and third children were recorded in Wilmington vital records, but there are no vital record entries for the other four children. The family moved to Framingham, Massachusetts, and Isaac Buck was rated in Framingham in 1754. "In the first place I give to my Daughter Ruth Buck Six shillings & Eight pence Lawfull money and one Cow to be paid unto her at the end of one year after my decease and these with what she hath already had to be to her in full for her part of portion out of my Estate." Ruth may have been given real or personal property by her father at the time of her marriage in 1729 or when her father sold one half of his homestead in 1747 to her half-brother for 400 pounds. "I have taken into my house...a famaley Last from Framingham the Name of Isaac Buck and his wife Ruth and their Children Susanna and Joseph, March ye 25th:1756. Joseph Richards." On 5 May 1756 the Southborough Town Council directed the constable to warn Isaac Buck, his wife Ruth, and two of their children, Susanna and Joseph, to get out of town forthwith. This was a formal notification, customary of the times, which would legally relieve the town of any responsibility to support the Bucks, who were called "a poor family in low circumstances." It is unknown if the Isaac Buck family left Southborough at this time. If they did, they may have returned to Framingham, where Isaac Buck died in 1780.. There are no death records or burial records for Ruth (Graves) Buck. Her husband, Isaac, died on 19 May 1780 in Framingham, but has no burial record. 1. Vital Records of Lynn, Massachusetts to the end of the Year 1849 (Salem, Mass. : The Essex Institute, 1906), 2 Volumes, Births, page 168, Ruth Graves entry. 2. Thomas W. Baldwin (compiler), Vital Records of Reading, Massachusetts to the Year 1850 (Boston, Mass. : New England Historic Genealogical Society, 1912), Marriages, page 298, Isaac Buck and Ruth Graves entry, 1729. 3. "Worcester County, MA: Probate File Papers, 1731-1881," digital images, New England Historic Genealogical Society, American Ancestors (http://www.americanancestors.org), Worcester County, Probate Packet #25,314 (6 images),Thomas Graves will, 1756. 4. "Southborough Massachusetts Notifications," The American Genealogist, Volume 67, page 215, October 1992, Isaac Buck family taken in by Joseph Richards. 5. Clerk of the Town of Southborough MA, "Records of the Town of Southborough 1727 - 1773", Family History Library (Salt Lake City, Utah), FHL Microfilm US/CAN 0,861,129, item 2, page 192, Isaac Buck family warned out of Southborough, Mass.